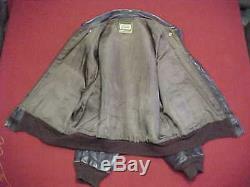 1940'S A-2 STYLE FLIGHT JACKET. The jacket is super clean/solid overall has a squadron patch & painted reverse (see photos). 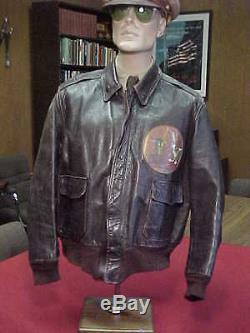 This 1940's - 1950's A-2 style leather flight jacket shows light/average wear overall. 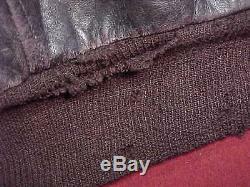 The dark chocolate brown colored leather is thick horsehide, has no excessively worn areas and remains very wearable (see photos). 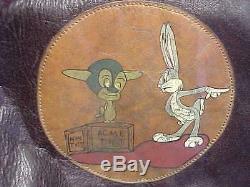 Upper left chest has a period made/sewn paint on leather Disney style cartoon art squadron patch that measures 5.5 inches in diameter (see photos). 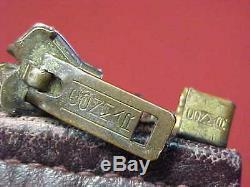 Zipper run is the original small tooth Conmar that works properly (see photos). 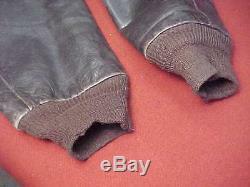 The knit cuffs & waistband are the wool originals with the usually seen small snags & losses (see photos). Collar tips & pocket flaps have working snaps and collar fold at the neck remains solid/without issues (see photos). 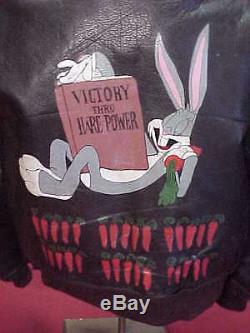 Reverse has a large painted Bugs Bunny cartoon with Bugs reading the book "Victory Thru Hare Power" (see photos). 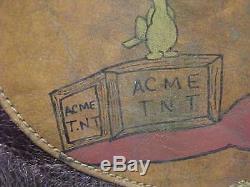 Below the cartoon are 30 mission bombs painted as carrots (see photos). The painting shows some expected light wear & crazing and is guaranteed period done. Lining to the interior is made of a satin-like material, has some light age soiling but remains very solid overall (see photos). 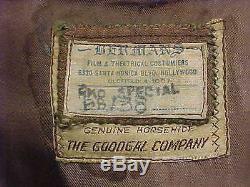 The makers label present below the collar indicates the jacket was made by the famous Goodgal Clothing Company (see photos). No size is shown but the jacket fits the mannequin as a size 38. 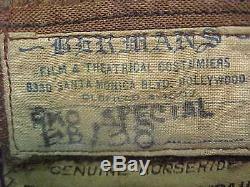 There is a small Bermans Film & Theatrical Costumiers label sewn over the Goodgal label (see photos). Label indicates the jacket was made for an RKO Studios Production (see photos). Measurements for this jacket are; shoulder seam to shoulder seam across the back 20 inches, shoulder seam to the end of the cuff material 24 inches, base seam of collar to bottom of waist - 24.5 inches. Armpit to armpit across the front - 24 inches. 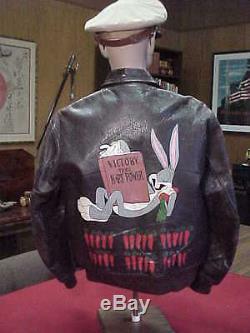 This jacket is a really cool 1940's AAF style A-2 flight jacket with a unique painted reverse that shows average use/wear. It was obviously used in a period RKO production and would be be great for display with any WWII aviation or Hollywood movie memorabilia collection. Super piece of vinatge art that could be an everyday wearer if desired. In the 1930s and 1940s, Hollywood's Golden Age, RKO was one of the Big Five studios with an amazing array of stars. I don't know what RKO production this jacket is from but I'm sure someone out there does. If you'd like to know more about us, watch for GP Storage on an episode of "American Pickers" this coming season. Terms and Conditions I MAKE EVERY EFFORT TO IDENTIFY, DESCRIBE & PHOTOGRAPH THE ITEMS AND CONDITIONS. PLEASE DON'T HESITATE TO CONTACT ME WITH ANY ADDITIONAL QUESTIONS. PLEASE CHECK MY FEEDBACK UNDER MY FORMER USER NAME: MOTELBUYER. IF YOU NEED TO CONTACT ME DIRECTLY, PLEASE CALL GROSSE POINTE STORAGE CO. 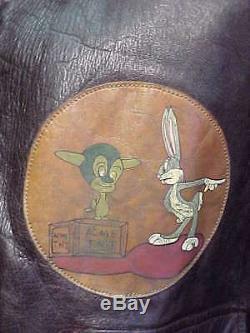 The item "1940'S AAF A-2 STYLE FLIGHT JACKET WithPATCH & PAINTED REVERSE HARE POWER" is in sale since Sunday, January 01, 2017. This item is in the category "Collectibles\Militaria\WW II (1939-45)\Original Period Items\United States\Uniforms". The seller is "gpstorageco*" and is located in Detroit, Michigan. This item can be shipped worldwide.